It was Larry Gryskevich's sixth home run of the 1990 season and it helped his Savannah Cardinals to a win over Greenboro. The home run came with one on in the 7-2 Savannah win. Gryskevich also plated a run on a single, according to The Greensboro News & Record. Gryskevich went on to hit a total of seven home runs for Savannah that year after hitting none the previous year at short-season Hamilton. Those seven home runs would be his only ones as a pro. 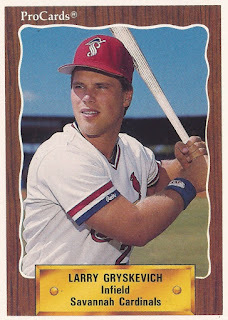 Gryskevich's career began in 1989, signed by the Cardinals as a free agent. He's credited with playing his college ball at Oral Roberts University and at Valdosta State. He was from Weirton, W.V. At Oral Roberts in February 1986, Gryskevich combined with another pitcher on a no-hitter. With the Cardinals, Gryskevich served mainly as a first baseman. He got into 34 games at short-season Hamilton. He hit just .134. He moved to single-A Savannah for 1990. He had a pinch-hit single in an April game. Overall, he hit .240 with those seven home runs. Gryskevich also briefly tried his hand at pitching, where he'd had success in college. He got into three games, giving up five earned in 2.2 innings of work. It was his final season as a pro.